Baby, it’s cold outside. And you’re probably doing everything you can to stay warm this season. You might even consider getting a space heater to keep your home nice and toasty. But did you know that space heaters can be extremely dangerous in homes and aren’t even a great source of heat? Below are three key questions you should ask yourself before using a space heater in your home. 1. How Are Space Heaters Dangerous? According to the U.S. Consumer Product Safety Commission, each year more than 25,000 homes catch fire and more than 300 deaths occur as a result of using space heaters in homes. While it is recommended that you do not use a space heater in your home, there are certain precautions you can take to prevent a winter house fire from occurring. First, be mindful of where in the home you place the heater. It is recommended to keep space heaters three feet away from any other furniture or objects. 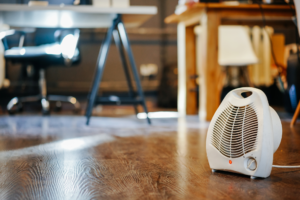 In addition, when considering the different types of space heaters, keep your eye out for ones that have tip-over and over-heat protection and safety standard certifications. Tip-over protection is especially important in the event that the space heater falls over and turns off, reducing the risk of a fire or damage. 2. Why Won’t Space Heaters Heat My Home Effectively? Space heaters tend to use up a lot of energy in your home, resulting in higher utility bills. On top of that, only the immediate space around the space heater is warmed, causing only a small space of your home to get this heat source and putting yourself at risk for a fire. 3. How Can I Prepare and Prevent a Winter House Fire? Winter fires are different because there are usually different factors that cause them. While over-heating is the second leading cause in house fires, other things that may contribute to fires are winter storms, candles and holiday decorations. So, space heaters obviously aren’t the only way fires are caused in homes. One effective way that you can prevent a winter house fire is to have your dryer vents cleaned. You might think that you get all the lint out of your dryer, but usually not all of it is caught. If too much is built up, it can result in a house fire. Our dryer vent cleaning service will eliminate lint stuck in your clothes dryer, potentially saving your home from a house fire. For preventing house fires, ServiceMaster of Columbia is your best resource. Contact us to schedule your dryer vent cleaning service or to learn more about how to protect your home from fire.